Mark JennerNZ Business DirectorWPP AUNZMark.Jenner@wppaunz.comThe search for a USP is futile and tim..
Mark LollbackCEO, Australia & New ZealandGroupMMark.Lollback@groupm.comIt’s time we used d..
Dennis WongManaging DirectorKantar ConsultingD.Wong@kantarconsulting.com.au Avoiding the ..
Nick BayesGeneral ManagerThe Brand Agency, PerthNBayes@brandagency.com.auHannah MuirheadLead Strateg..
Toby Harrison Chief Strategy Officer Ogilvy, Sydney Toby.Harrison@ogilvy.com.au Short-ter..
Daye MoffittHead of Strategy,Landor AustraliaDaye.Moffitt@landor.comOnly dead fish go with the flow:..
Daren PooleGlobal Creative Domain LeadInsights Division, KantarDaren.Poole@millwardbrown.com Co..
Paul EversonManaging DirectorJ. Walter ThompsonPaul.Everson@jwt.com2018 will be the year that creati..
Richard BrettCEOOgilvy Public RelationsRichard.Brett@ogilvy.com.au An Argument for OptimismHow ..
Lynn CliftPlanning Director - Creative StrategywhiteGreyLynn.Clift@whitegrey.com.au ..
Parent Company: Harvey Norman Holdings LimitedBrand Value: $519 Mil.Headquarter City: Homebush West,..
Parent Company: Commonwealth Bank of AustraliaBrand Value: $16,412 Mil.Headquarter City: Darling Har..
Parent Company: Australia and New Zealand Banking Group LimitedBrand Value: $11,907 Mil.Headqua..
Parent Company: National Australia Bank LimitedBrand Value: $8,781 Mil.Headquarter City: Melbou..
Parent Company: Westpac Banking CorporationBrand Value: $9,306 Mil.Headquarter City: SydneyIndustry:..
Parent Company: Qantas Airways LtdBrand Value: $1,637 Mil.Headquarter City: SydneyIndustry: Air..
Parent Company: Woolworths Group LimitedBrand Value: $281 Mil.Headquarter City: VictoriaIndustry: Re..
Parent Company: Bank of Queensland LimitedBrand Value: $469 Mil.Headquarter City: Newstead, Queensla..
Parent Company: Commonwealth Bank of AustraliaBrand Value: $1,338 Mil.Headquarter City: PerthIndustr..
Parent Company: Foxtel GroupBrand Value: $1,912 Mil.Headquarter City: SydneyIndustry: Telecom P..
Parent Company: Wesfarmers LimitedBrand Value: $1,878 Mil.Headquarter City: Hawthorn East, Vict..
Parent Company: Singapore Telecommunications LimitedBrand Value: $3,503 Mil.Headquarter City: Sydney..
Parent Company: Bendigo and Adelaide Bank LimitedBrand Value: $433 Mil.Headquarter City: Bendigo, Vi..
Parent Company: Origin Energy LimitedBrand Value: $2,236 Mil.Headquarter City: SydneyIndus..
Parent Company: CLP Holding LimitedBrand Value: $542 Mil.Headquarter City: MelbourneIndustry: Energy..
Parent Company: TPG Telecom LimitedBrand Value: $581 Mil.Headquarter City: PerthIndustry: Telec..
Parent Company: JB Hi-Fi LimitedBrand Value: $501 Mil.Headquarter City: MelbourneIndustry: RetailYea..
Parent Company: TPG Telecom LimitedBrand Value: $534 Mil.Headquarter City: North Ryde, NSWIndus..
Parent Company: Woolworths Group LimitedBrand Value: $445 Mil.Headquarter City: Bella Vista, NSWIndu..
Parent Company: Restaurant Brands International Inc.Brand Value: $393 Mil.Headquarter City: SydneyIn..
Parent Company: Woolworths Holding Limited /South AfricaBrand Value: $412 Mil.Headquarter City: Rich..
Parent Company: Wesfarmers LimitedBrand Value: $354 Mil.Headquarter City: Hawthorn East, VictoriaInd..
Parent Company: Campbell Soup CompanyBrand Value: $316 Mil.Headquarter City: SydneyIndustry: Food &a..
Parent Company: Diageo PLCBrand Value: $340 Mil.Headquarter City: Bundaberg, QueenslandIndustry: Alc..
Parent Company: Qantas Airways LimitedBrand Value: $279 Mil.Headquarter City: MelbourneIndustry: Air..
Parent Company: Wesfarmers LimitedBrand Value: $5,207 Mil.Headquarter City: Hawthorn East, Vict..
Parent Company: Suncorp Group LimitedBrand Value: $1,250 Mil.Headquarter City: BrisbaneIndustry: Ban..
Parent Company: Woolworths Group LimitedBrand Value: $7,105 Mil.Headquarter City: Bella Vista, New S..
Parent Company: Anheuser Busch InBev SA/NVBrand Value: $343 Mil.Headquarter City: Melbour..
Parent Company: Anheuser-Busch InBev Sa/NVBrand Value: $545 Mil.Headquarter City: MelbourneInd..
Parent Company: Anheuser-Busch InBev SA/NVBrand Value: $410 Mil.Headquarter City: Melbour..
Parent Company: Westfield Corporation, Scentre GroupBrand Value: $2,107 Mil.Headquarter City: Los An..
Parent Company: Insurance Australia Group LimitedBrand Value: $1,222 Mil.Headquarter City: New South..
Parent Company: Insurance Australia Group LimitedBrand Value: $473 Mil.Headquarter City: Melbo..
Parent Company: Suncorp Group LimitedBrand Value: $483 Mil.Headquarter City: BrisbaneIndustry: Insur..
Parent Company: Telstra Corporation Ltd. Brand Value: $10,774 milHeadquarter City: MelbourneIndustry..
Parent Company: Westpac Banking CorporationBrand Value: $2,658 Mil.Headquarter City: SydneyIndu..
Parent Company: Heineken N.V., Molson Coors Canada Inc., AB (Anheuser-Busch) InBev SA/NVBrand Value:..
Parent Company: AGL Energy LimitedBrand Value: $2,188 Mil.Headquarter City: North Sydney,..
Parent Company: Woolworths Group LimitedBrand Value: $741 Mil.Headquarter City: Bella Vista, N..
BAV’S “CULTURAL RANKINGS” TOOL CAPTURES A SNAPSHOT OF CONSUMER MINDSET AND MARKET ..
ASSESSING THE STRENGTH OF BRAND AUSTRALIA ITSELF ..
Personalization – How do mass brands compete? Anna StoyanovaVP, Head of Product, Australia & NZEssenceAnna.Stoyanova@essenceglobal.comPersonal..
Jarrod PayneBrand Strategy Head Kantar Millward BrownJarrod.Payne@kantarmillwardbrown.comAustralia t..
Brian Walker-CatchpoleSenior Consultant - Brand and CommunicationsKantar TNSBrian.WalkerCatchpole@tn.. 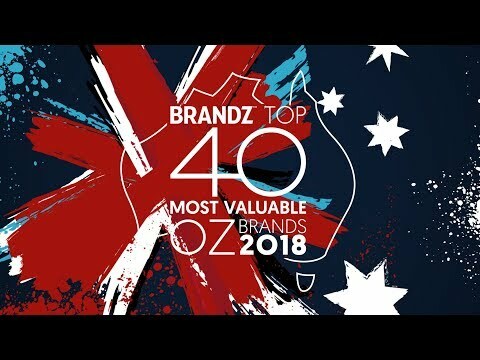 Rob PardiniChief Data ScientistWPP AUNZRob.Pardini@wppaunz.com Towards negligible brand value: ..